You can either make up your own pet first aid kit or buy one. 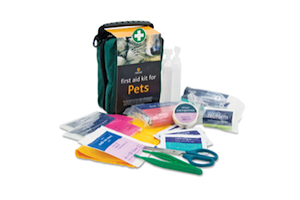 You can buy a pet first aid kit in our store. First aid kit for pets offers peace of mind. If your pet suffers a cut, bruise, or strain, you are fully prepared to treat them and get them to safety. 2 x 20ML PODS OF SALINE- To wash away dirt and debris from your pet's eyes and other areas. Simply wipe away excess fluid with a gauze swab or paper handkerchief. 1 x MEDIUM DRESSING BANDAGE WITH TIES - To cover an injury, these have tie bandages attached, but they do not fasten tightly. Use the microporous tape if additional retention is needed. Cut off the bandage ends after tying. 1 x FOIL BLANKET - To retain body warmth and help combat shock, use this to wrap your pet on the journey to the vet. It may be necessary to hold the blanket in place. 1 x MICROPOROUS TAPE - To help hold dressings or bandages in place. It tears easily, so scissors are not required. 1 x CONFORMING BANDAGE - If a sprain is suspected, use this around the limb and fasten with tape. Cut off the excess bandage and retain the rest for future use. 2 x PLASTIC POUCHES - To cover foot injuries and help keep them clean, fasten with tape. It will minimise blood spillages on carpets, car upholstery, and furniture. 4 x ALCOHOL FREE CLEANSING WIPES - Useful for cleaning up the cut and possible infection, or to clean your hands up if your working on an animal. 1 x Scissors - Useful to cut fur out of the way in the case of a cut or a burn. 1 x Tweezers - Useful for removing objects like a thorn from a paw. Tweezers are more likely to remove the entire object, whereas fingers can break an object and leave part remaining.